Inner sheet: 7x9.6 inch ( folded into 2 pages ). We will send the right link on Amazon for you to place order after your draft is approved. The invitation pack does not include the RSVP card, customer who need RSVP,please contact us by email or contact seller to send us an Amazon message. 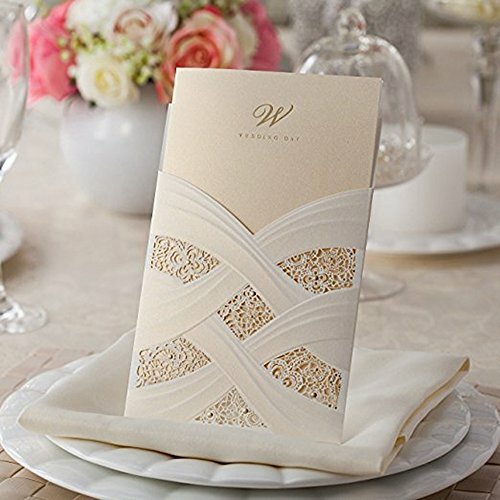 5 x 7.3 inch Ivory laser cut wedding invitation with free ivory envelopes. You can print the invitation with your own design by home printer if you are good at DIY. If you aren't satisfied with your purchase or have any questions/concerns please do not hesitate to contact us, we are here to help you. You can also ask for a TEMPLATE by email. If you have any questions about this product by Doris Home, contact us by completing and submitting the form below. If you are looking for a specif part number, please include it with your message.